^ Leo Steinberg, Who's who in Michelangelo's Creation of Adam, in Art Bulletin, December 1992, pp. 553-554. ^ Meshberger, Frank Lynn (10 October 1990). “An Interpretation of Michelangelo's Creation of Adam Based on Neuroanatomy”. JAMA 264 (14): 1837-41. doi:10.1001/jama.1990.03450140059034. PMID 2205727. http://jama.jamanetwork.com/article.aspx?articleid=383532 2012年9月24日閲覧。. Pdf. ^ Appler, Mark Lee (6 March 1991). 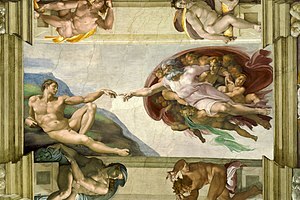 “The Creation of Adam: Divine Funster Decrees We Are What We Eat: Chicken?”. Letters in comment: JAMA 265 (9): 1111. doi:10.1001/jama.1991.03460090059025. PMID 1995993. http://jama.jamanetwork.com/article.aspx?articleid=385198 2012年9月24日閲覧。. ^ http://www.mentalhealthandillness.com/creation_fr.html, Mental Health & Illness.com, Retrieved September 21, 2010. Bruschini, Enrico (2004). Masterpieces of the Vatican. Vatican City: Edizioni Musei Vaticani. pp. 160. ISBN 978-8-881-17088-3. http://books.google.it/books?id=O7QzAQAAIAAJ&hl=en.